EmailExpert reports email marketing produces a $44.25 return for every $1 spent. Over 77% of online customers prefer receiving marketing messages via email, according to MarketingLand. Nurtured leads make 47% larger purchases than non-nurtured leads, reports Unbounce. And 81% of digital shoppers in the US say they’re at least “somewhat likely” to make additional purchases as a result of targeted emails, according to Harris Interactive. How did this happen? Wasn’t email predicted to die off several years ago? Email works well for marketers because it’s a singular channel, not a fragmented space like social media. And the sheer volume of email users is still a factor: 85% of internet users have an email address, while just 62% use social media. All of these developments have made customer email addresses very, very valuable to marketers, but in the process, they’ve also become harder to get. Nowadays, simply asking users for their email isn’t enough. Marketers have needed to become much more creative to get signups, and more importantly, learn to offer value in exchange for an address. Quiet little sidebar widgets simply aren’t visible enough (by themselves) to generate significant email lists. If you want high signup rates, you need to bring the signup offer to your visitors’ attention. That can mean placing it within the content users are interacting with, above the fold in the hero section, or over top of the page in a clearly visible lightbox. 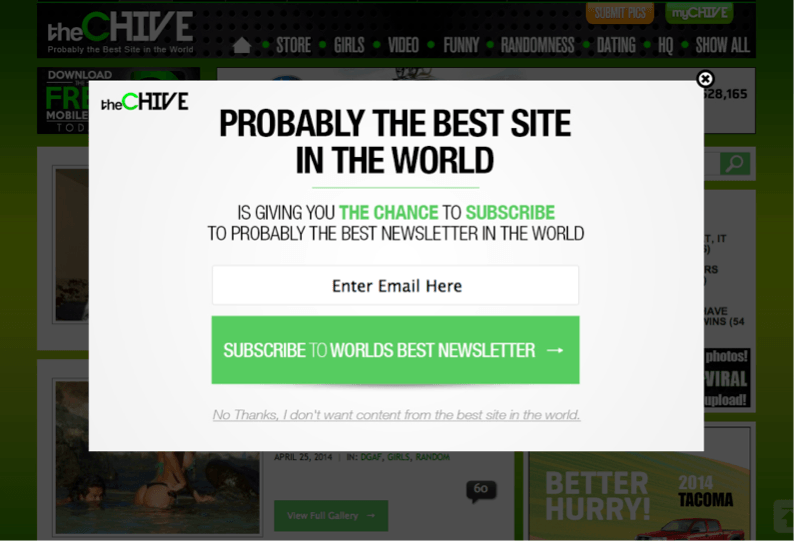 This one is obvious, but your email signup must be relevant to the content your users are browsing. If users are reading your articles on basket weaving, your email signup must promise something that adds relevant value on the same topic. What are you offering in return for a visitor’s email address? Is it a free knowledge resource? A discount or coupon? A free tool? Simply having “Get Updates” as your value promise isn’t enough. 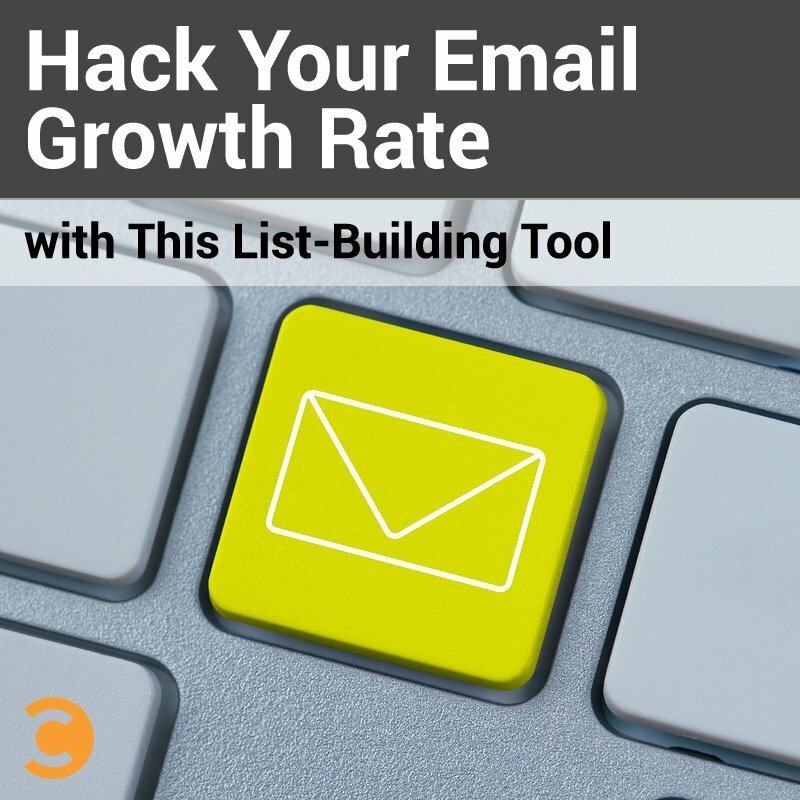 If you want results, the perceived value of signing up for your list must be high. You’ll need your creative chops to create messaging that conveys value and relevance, but for visibility, you just need the right tool. Which Signup Tools Offer the Most Visibility? Here are three of my favorite tools for making a signup form highly visible. Foobar by FooPlugins is one of my preferred signup widget tools. It gives you a bright, visible bar at the top of the page with room to create your marketing message. Magic Action Box is the ultimate cure for sidebar blindness. This handy little tool allows you to embed call-to-action, opt-in, and sales boxes within your content. Exit-intent technology offers maximum visibility and creative control. When users begin to abandon a page without buying anything or signing up, the technology activates what’s known as an exit overlay. Exit overlays are modal lightboxes that display last-chance messaging to engage the user before they leave the site. Let’s take a look at one of these tools in action. For 30 years, UK-based Gr8tFires has manufactured high-end woodburning stoves and fireplaces. Their multi-fuel stoves burn coal, smokeless fuels, anthracite, and wood, allowing customers to increase energy efficiency without sacrificing comfort. Since installation costs are one of Gr8Fires biggest customer pain points, the exit overlay also helps them this issue early with potential customers. Gr8Fires’ exit overlay campaign generated a 300% increase in email signups. On a typical day, the campaign captured anywhere from 15 to 20 new email signups. Smart marketers know that in order to generate email signups, you must offer helpful, informative content. 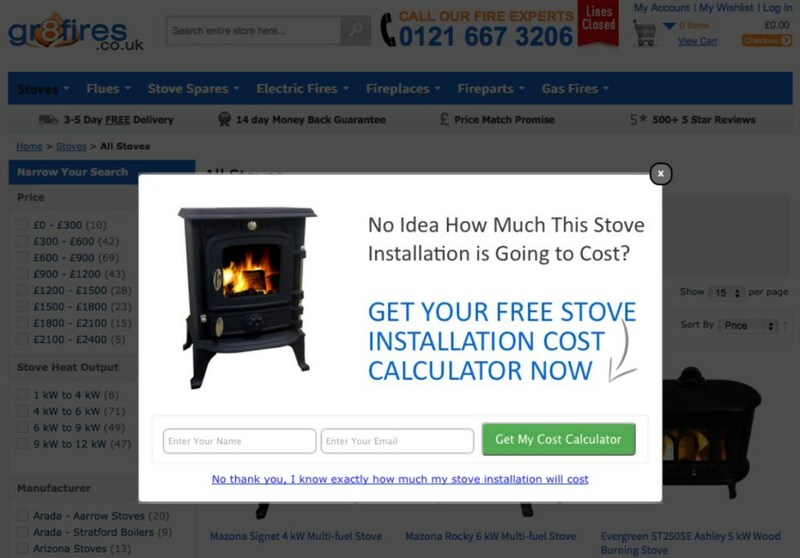 By offering prospects truly valuable information for free, Gr8Fires generated a fantastic lift for their online store. As a general rule, effective email signup tools must have a high degree of visibility, be directly relevant to the content and offers on the page, and offer something truly valuable to the user.